They fork out USD262 per month on dining. Singaporeans' culture will never be complete without food. 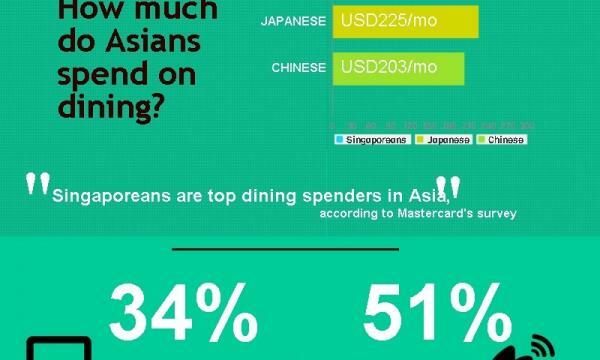 Thus, it comes as no surprise that Singapore emerged as Asia's top dining spenders, according to Mastercard's survey on Consumer Purchasing Priorities this 2013. The survey revealed that Singaporeans fork out an average of USD262 per month on dining. Japanese and Chinese consumers follow closely behind Singapore with an average monthly dining spend of USD225 and USD203 respectively. The survey also found that 34% of Singaporeans will book dining deals on coupon sites/apps while 51% will check online for credit card promotions. Meanwhile, Singapore is also quite a critic when it comes to food as more than half of the respondets (52%) check for online reviews of dining outlets. Forty-six percent will also check out places for dining from families/friends/colleagues. “Food blogs are playing an increasingly influential role in Asia’s food scene, turning both locals and tourists alike to the best eats in town and placing lesser-known eateries on the radar of the keen, tech-savvy diners," says Georgette Tan, group head, Communications, Asia/Pacific, Middle East & Africa, MasterCard.